Portadown manager Ronnie McFall is refusing to relax in the aftermath of Saturday’s Irish Cup semi-final success. 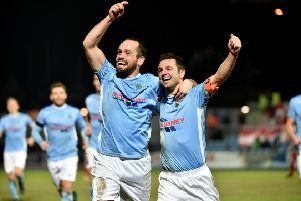 A 3-1 victory against Ballymena United at The Oval has secured the Ports a spot in the May 2 showpiece. However, Danske Bank Premiership points remain a target in pursuit of European qualification before Portadown can switch the focus to a Windsor Park final and Glentoran. “We want European football wrapped up before the Irish Cup final, so must focus on every league game and not switch off,” said the Ports boss. “We have Warrenpoint Town away this weekend and must prepare in the right way. “We have six league games left and third is the target for a final position. “The final is going to be a great occasion, with plenty of colour and a massive crowd. McFall did take a moment to reflect on Saturday’s assured cup performance. “We were outstanding in the first half, then professional after the break,” he said. “The fans got behind us from the start and we really played with great intensity from the kick-off.